Victoria Nuland — who acted as the front person for the State Department’s coup in Kiev — bluntly expressed the opinion of the United States toward the European Union back in February. Nuland employed a choice expletive when she dismissed the glacial movement of EU apparatchiks and their apparent political paralysis in response to the State Department’s covert effort to install a cooperative regime in Ukraine. The MH17 downing was engineered to move the EU and public consensus in the direction of open confrontation with Russia. The EU does not want to appear indifferent and lackadaisical to the exploitatively propagandized tragedy, so it will lend its support for a new round of sanctions and, most importantly, the neocon introduced Senate bill 2277, the so-called “Russian Aggression Prevention Act of 2014” more appropriately dubbed the World War III bill. The legislation was introduced by Sen. Bob Corker, who is slated to become the chairman of the Senate Foreign Relations Committee if Republicans take control of that house in November. If passed the Corker bill will declare Moldova, Georgia, and Ukraine “major non-NATO allies” and move NATO troops and equipment into the former Soviet republics of Poland, Lithuania, Latvia and Estonia. It will put an ABM system on the fast track in Eastern Europe and step up military and intelligence assistance to Ukrainian forces fighting against separatists in Donbass and elsewhere in Eastern Ukraine. Other suggestions arising from Congress include adding Armenia, Bosnia-Herzegovina, Finland, Kosovo, Macedonia, Montenegro, and Sweden to NATO. The Corker bill will encourage the color revolution crowd to subvert the Russian Federation. “S. 2277 would direct the secretary of state to intensify efforts to strengthen democratic institutions inside the Russian Federation, e.g., subvert Vladimir Putin’s government, looking toward regime change,” writes Patrick Buchanan. Video: Congress and establishment media blame Russia for MH17 downing without evidence. “The U.S. directive to the State Department to work with NGOs in Russia, blatant intervention in the internal affairs of a sovereign nation, would be answered with a general expulsion of these agencies from Moscow,” Buchanan adds. Corker and the neocon Republicans – including Sens. John McCain, Lindsey Graham, Marco Rubio, Mitch McConnell, and others who co-sponsored S. 2277 – are looking to push a reluctant EU into a war posture with its trading partner. NATO has morphed from a post-war relic ostensibly designed to protect Europe into a belligerent alliance aligned against the Russian Federation. It works not only to destroy its economic relationship with Western Europe, but foment regime change within its borders. “Western elites desire to loot Russia, a juicy prize, and there stands Putin in the way. The solution is to get rid of him like they got rid of President Yanukovich in Ukraine,” writes Paul Craig Roberts. The last time a spat in Eastern Europe turned excessively violent, 65,000,000 people died and set the stage for the death of 85,000,000 a few years later. In total, during the 20th century, an excess of 250,000,000 people were killed by government. A repeat of a similar situation will not result in a conventional war, but a nuclear one. “We have 450 active ICBMs, but because of geographical constraints, they can really only be used to attack Russia,” writes Eugene K. Chow. The United States has a total inventory of 4,650 nuclear weapons, including nearly 2,000 actively deployed warheads, and Russia has about the same, Chow explains. Nuclear weapons, like all weapons, were invented to be used and gain superiority and dominance over an enemy. “The crossbow, the dreadnought, poison gas, the tank, the landmine, chemical weapons, napalm, the B-29, the drone,” all of these weapons have been used, writes Tom Engelhardt, and some of them still are. 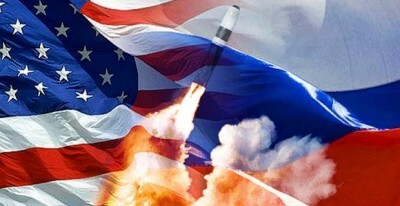 Recently a senior adviser to Vladimir Putin said the U.S. plans a nuclear first strike on Russia. Paul Craig Roberts insists the placement of ABM systems in Eastern Europe are intended to intercept Russian missiles after a first strike. “The Western elites and governments are not merely totally corrupt, they are insane. As I have previously written, don’t expect to live much longer,” Roberts warns.